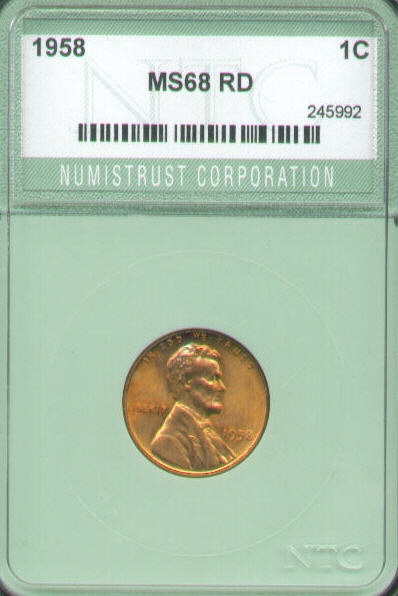 This 1950 S cent is certified by National Numismatic Certification. They gave it a Mint State 67 red. 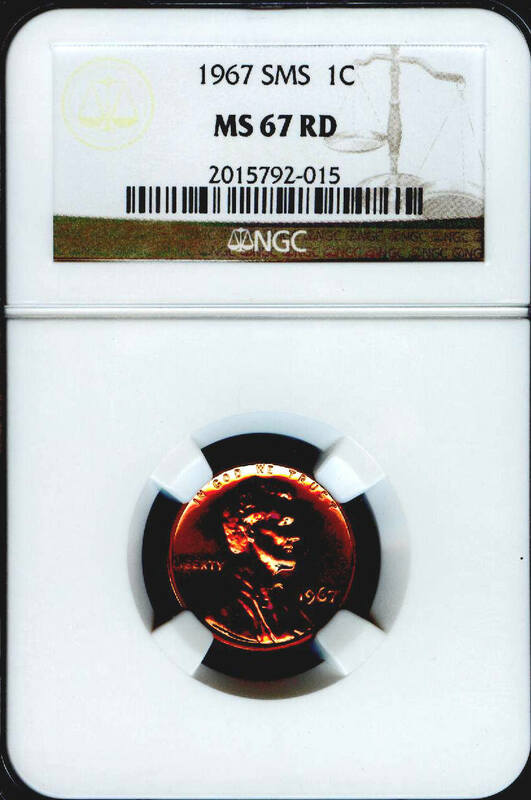 It does have a couple spots on the coin, but the color and over all luster makes up for it. 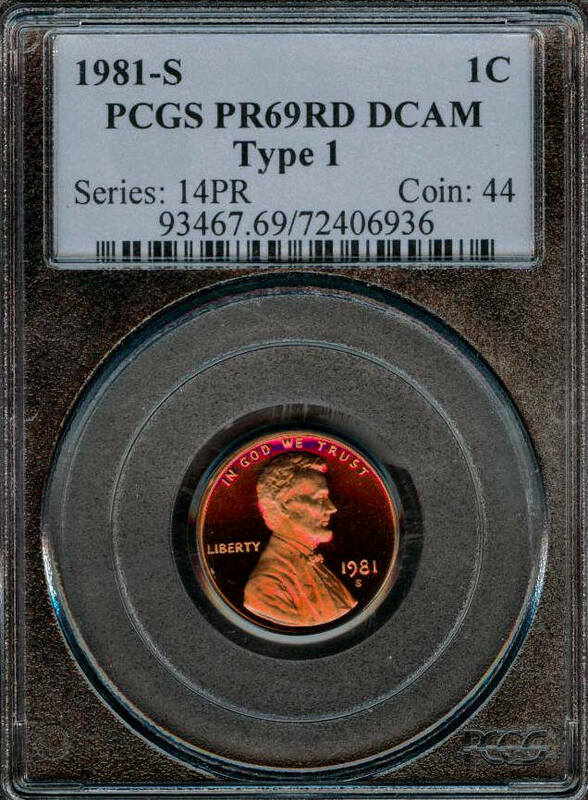 A pleasing example with great eye appeal, if you like a little color on your coins this one is for you. It is overall red, but marbles in a couple different shades. 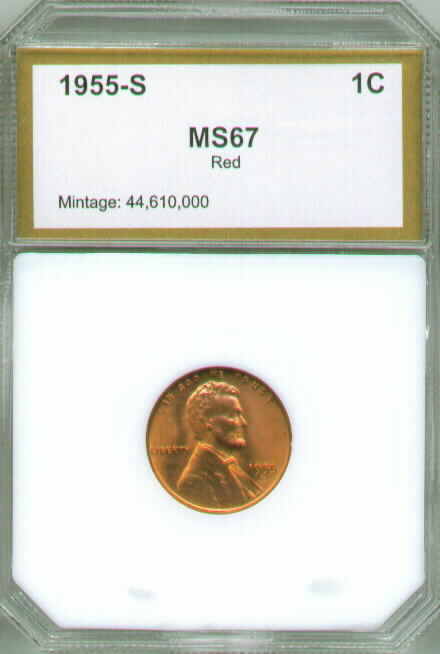 ACG graded this coin MS-66. 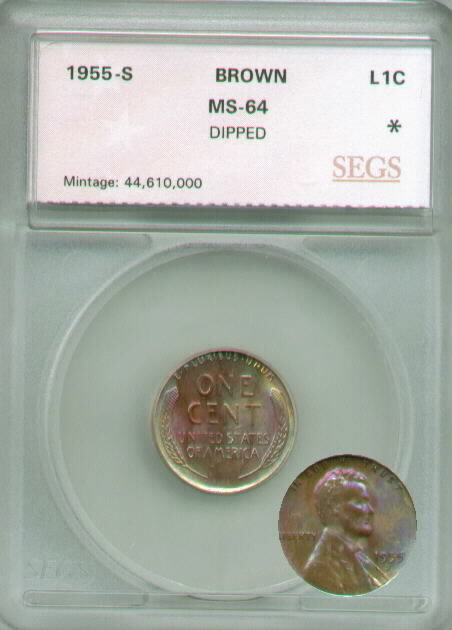 Here we have a cent that has virtually mark free fields. 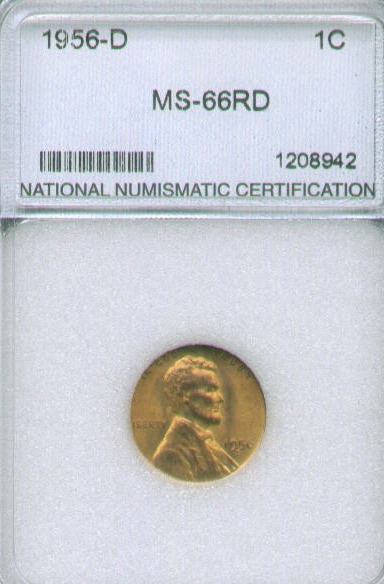 It is graded MS-67 by NNC and would make a nice addition to any collection. 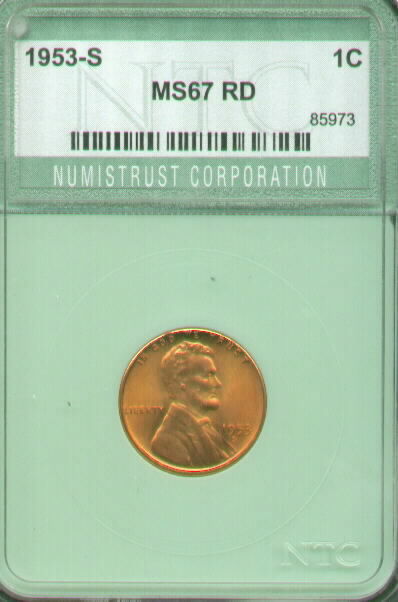 This 1953 cent is certified by Numistrust corp. They gave it a Mint State 67 red. It only has one spot on the front side of the coin at the rim. It has mark free fields and a strong strike. Next up is a couple 1954-S wheat back cents in PCI holders. Both these coins have bright red obverse and one carbon spot on the reverse, but who looks at the reverse. Although they trend for 85 dollars in MS67 grade, here they are only 24.99. 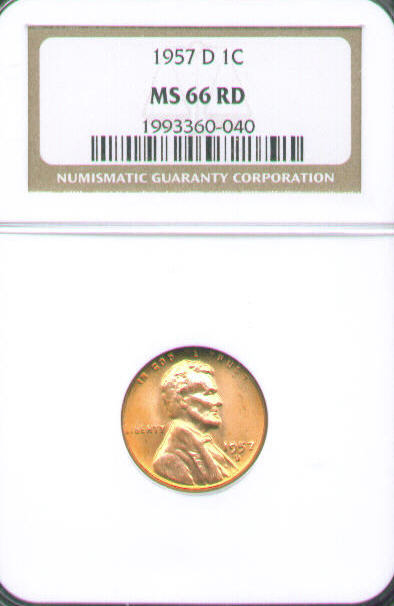 Numismatic Guaranty Corporation (NGC) gave this a coin a Mint State 66. 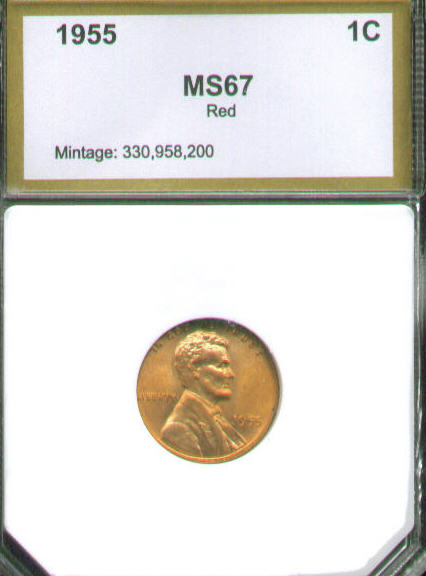 This coin has sharp details, MS-66 fields and nice cartwheel luster. 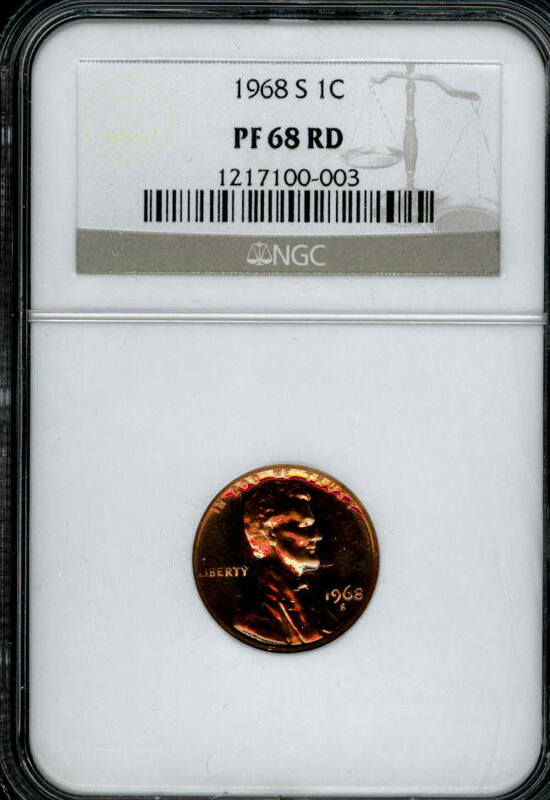 This wheatback penny is graded and encapsulated by PCI as Mint state 67. This would be a nice addition to any collection. 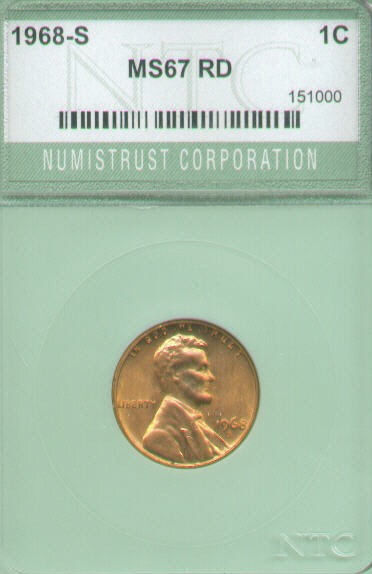 Here we have another 1955 ICG certified Abraham Lincoln cent although this one is from the San Francisco Mint. This one also has bright red color like it just came from the mint. Here we have a very nice looking rainbow toned cent. 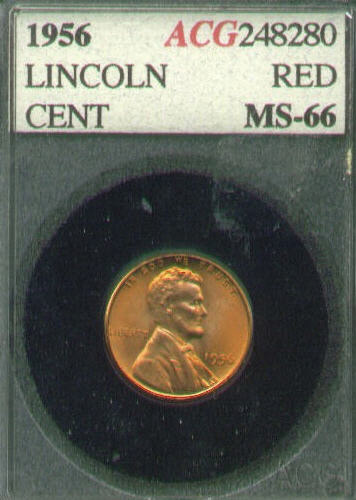 This certified wheat cent has reds, blues, yellow, orange, and purple. 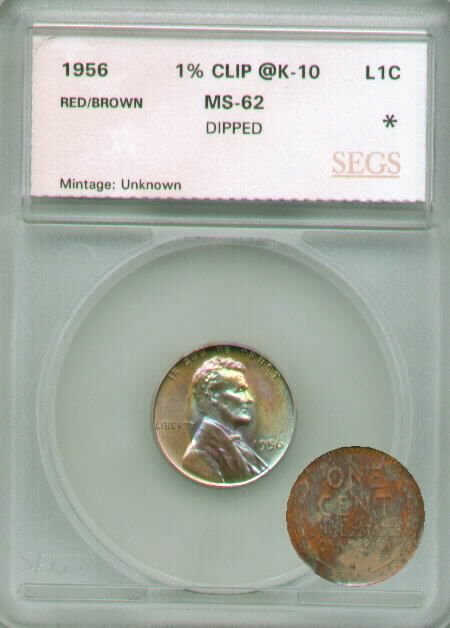 It is artificially toned as SEGS indicated "dipping" on the holder. Here we have a couple 1955 wheat back cents in PCI holders. Both these coins have minimal contact marks and a bold strike. 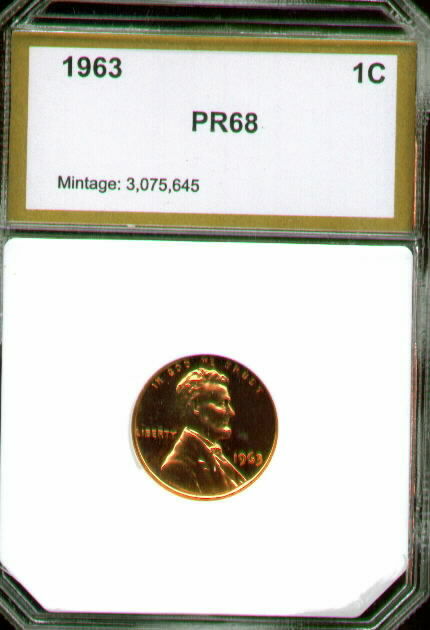 Good price for a wheatback cent graded mint state 67. 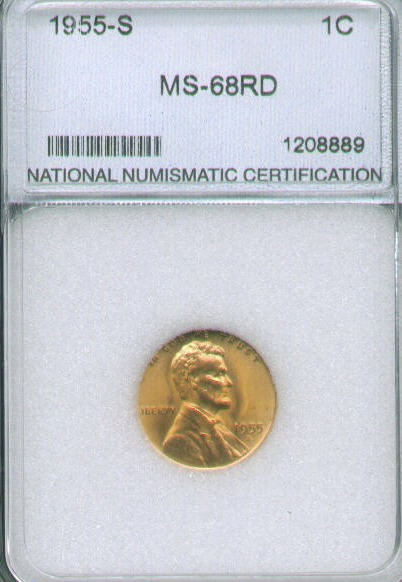 This 1955 S cent is certified by National Numismatic Certification. They gave it a Ultra high Mint State 68 red. It does have a nick after the "one" on the reverse but other then that this is an exceptional coin. Trends for $175 in MS67 condition. 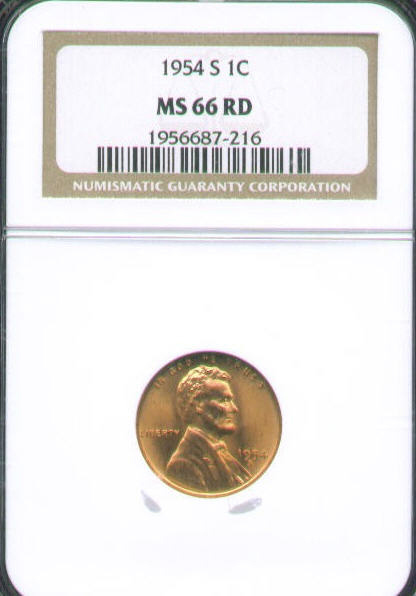 NNC graded this coin as Mint State 66. 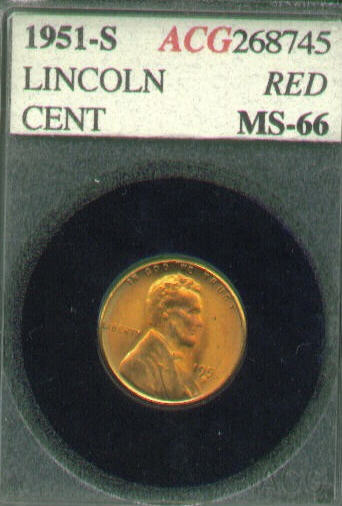 This obverse has nice even color and all the details are strong except the 6 in the date. There are only 2 needle point spots on this coin and luckily both are on the reverse. 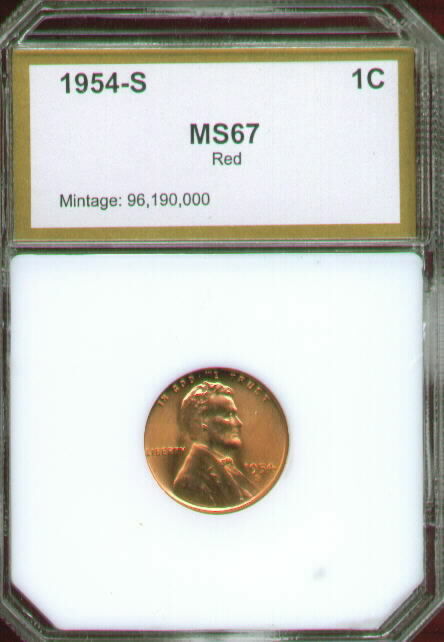 A pleasing example with killer eye appeal, if you like a little color on your coins this one is for you. It is overall red, but marbles in a couple different shades. 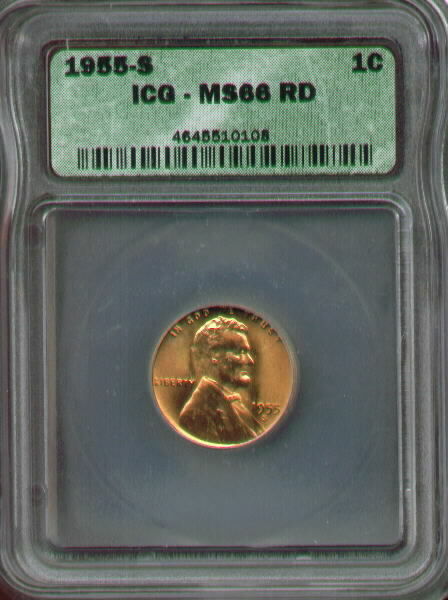 ACG graded this coin MS-66. 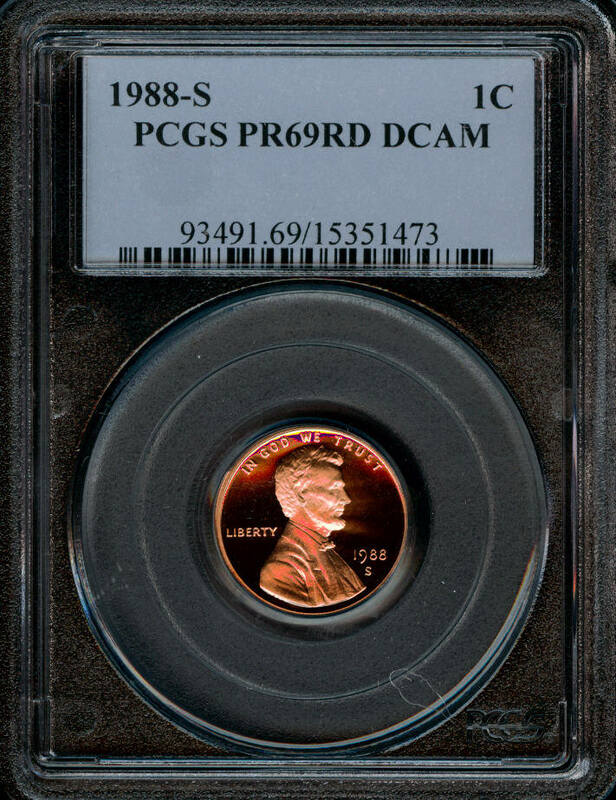 This 1957 wheat back cent was minted in Denver. They only made a mere 1 billion that year in Denver so these will obviously be very rare in a couple 1,000 years so you might want to put a couple away while they are still affordable. Yes that's right NTC gave this coin a grade of Mint State 68. Don't get me wrong it is a nice coin but MS68 come on. Eye appeal wise it's just not there, it has a little blue tone starting on his forehead and the reverse looks dirty for a 68. 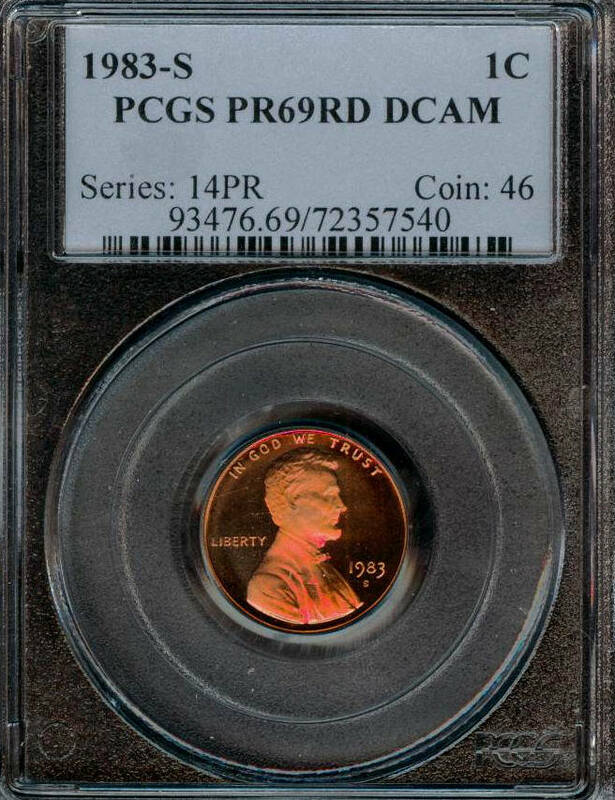 This is a very attractive 2 sided rainbow toned cent. At first glance it looks like the fields are just cloudy but once the light hits it right a rainbow of color jumps out at you. 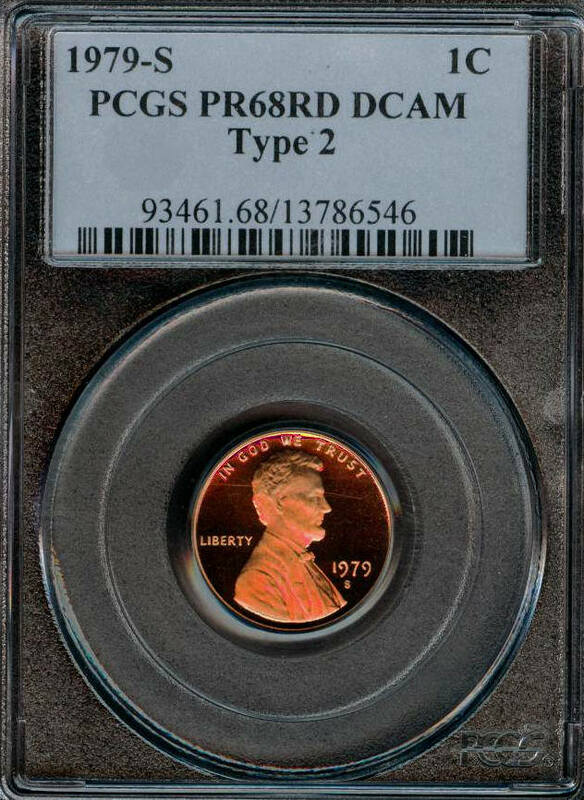 This coin would make a good addition to any collection. A nice looking coin in PCI holder. They gave this coin a Proof 68 grade. 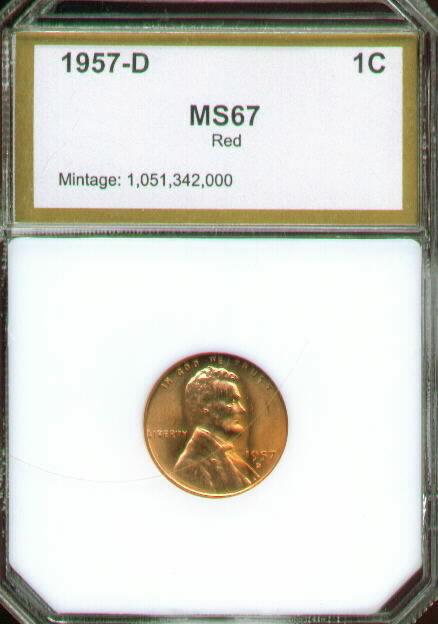 Colors just dance around the surfaces on the obverse of this coin while the reverse is a solid red. 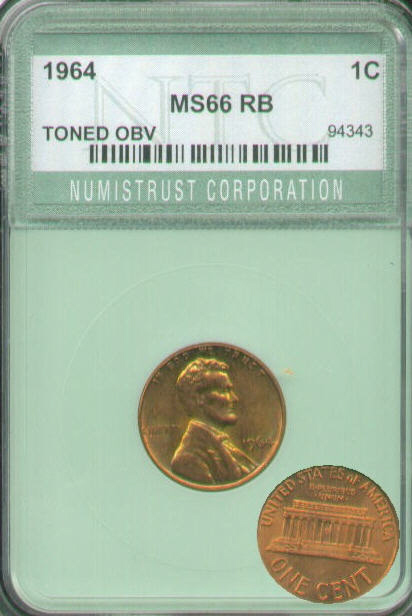 A very unique looking coin graded by NTC as MS-66 R/B. 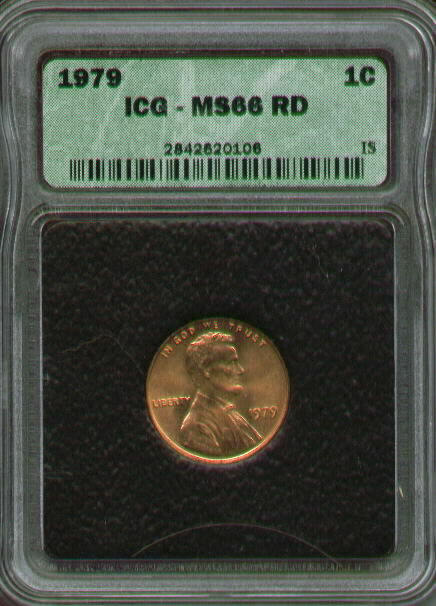 A beautiful example of a 1964 Memorial Lincoln cent. This coin displays nice frosty cameo and haze free fields. 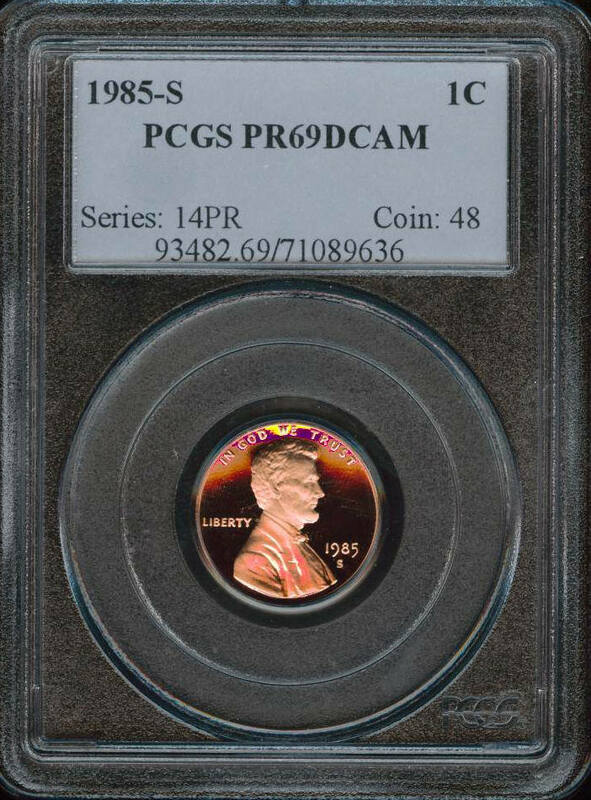 Proof coins is the sixties are scarce in cameo, grab this killer coin for only $24.99. Here we have the return of the "s" mint mark. 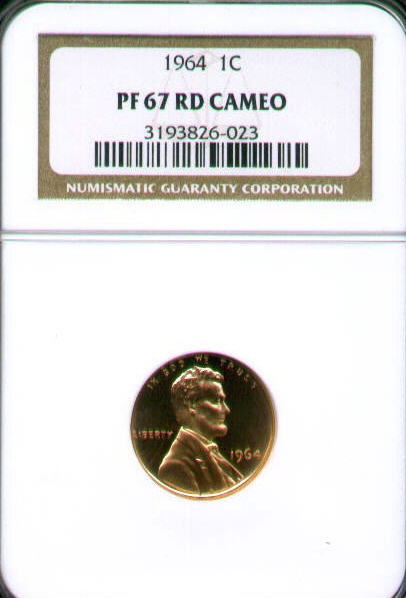 The US Mint stopped putting the San Francisco mintmark on the penny since 1955, this was the first year of it's return. 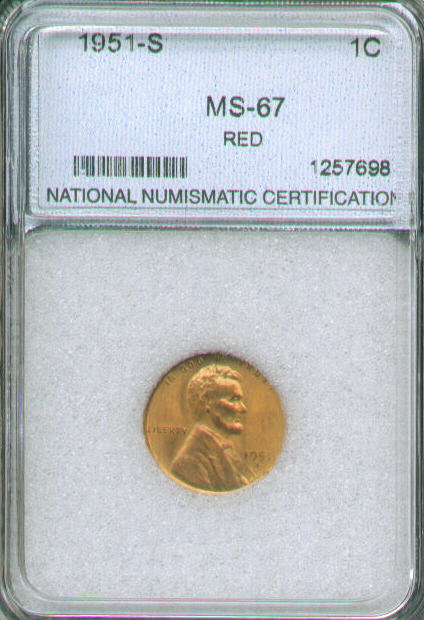 This one is graded by NTC as MS67 red. This was the first year the US Mint started making Proof sets again after the special Mint Sets failed to interest collectors. 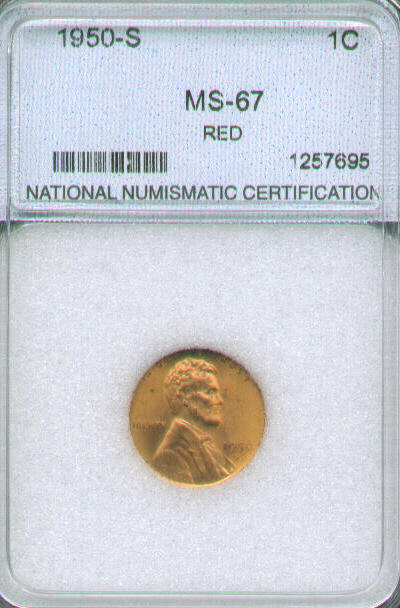 This one is has a deep red fiery color and is graded Proof 68 by NGC . It has orange luster bursting through the deep purple tone. 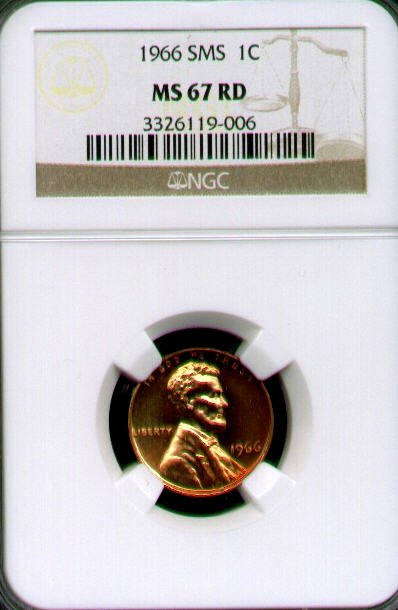 This purple/orange tone is on both the obverse and reverse of this coin. 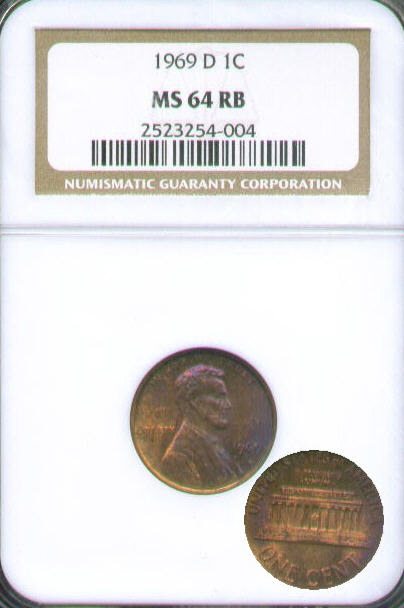 A very impressive NGC slabbed tone cent. 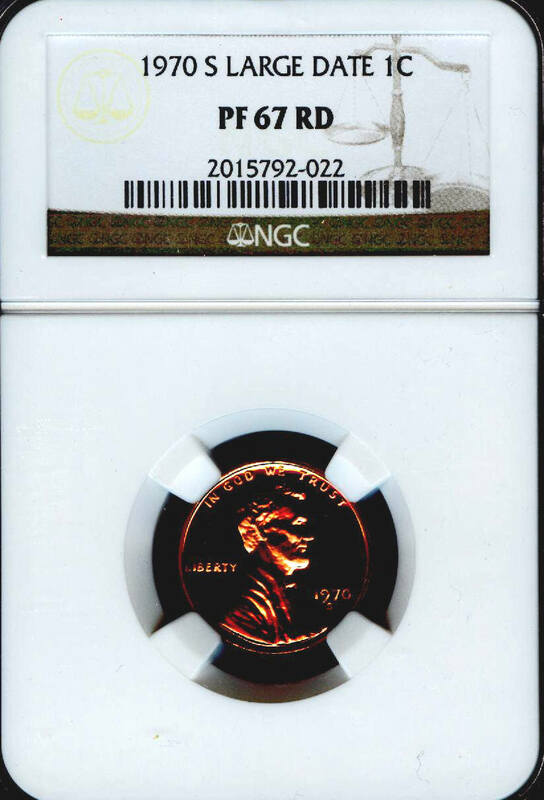 This Lincoln cent is certified by NGC as Proof 67. This coin has a bold strike, smooth surfaces, and mint luster. It is housed is ICG's Intercept Shield, which is claimed to be the "ultimate protection for your collectibles". 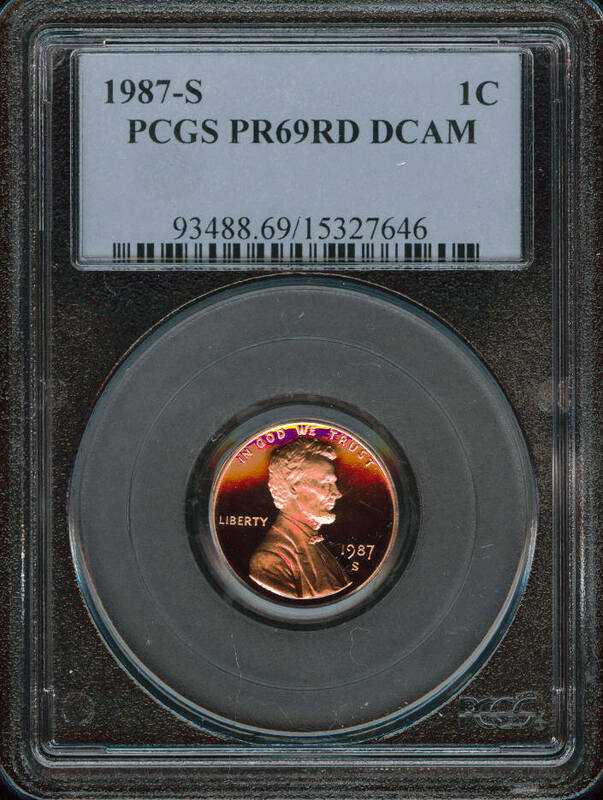 This Lincoln cent is certified by PCGS as Proof 69 Deep cameo. 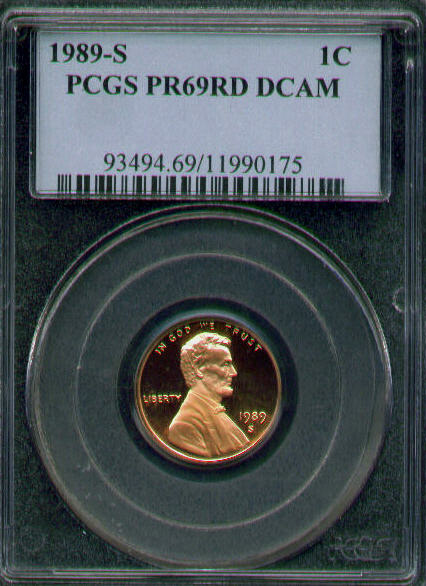 Next up is a 1986 Proof 69 Deep Cameo cent certified by PCGS. 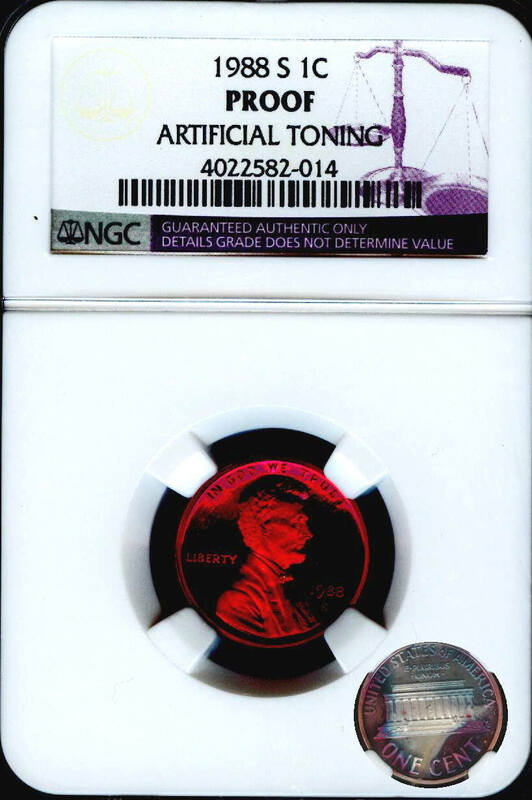 This coin has an ultra frost profile and mirrored fields. 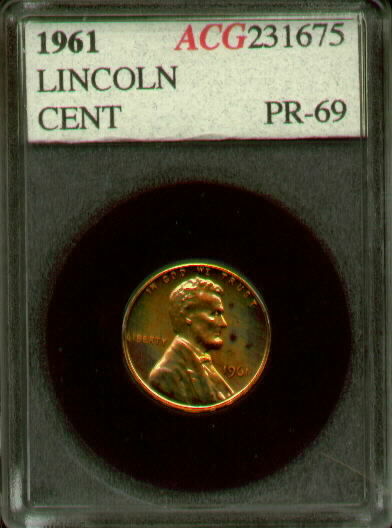 Here we have an amazing artificially toned 1988 cent. If this was naturally toned with these magnificent colors, it would easily sell for a couple hundred dollars. Since its AT it will only cost you 20 bucks.